ALLRig is now PACCAR Parts. Rodney's Transport Service (RTS) - the largest privately-owned trucking firm in NSW's Riverina region - took possession of its 200th Kenworth this week. PACCAR Australia - the leading provider of complete trucking solutions - will showcase its range of products and services at the 2014 International Truck, Trailer and Equipment Show (ITTES) on 3-6 April at the Melbourne Showgrounds. Darren Brook of Gilbert's Transport Services in Cavan, SA, is a huge fan of the ALLRig Rewards Program, especially given that it has rewarded him - and his family - with a luxurious 11-night holiday to Los Angeles, Hawaii and Disneyland. Australia's number one heavy-duty truck supplier, Kenworth, has delivered its 50,000th Australian-designed and manufactured truck at its Bayswater plant in Melbourne. 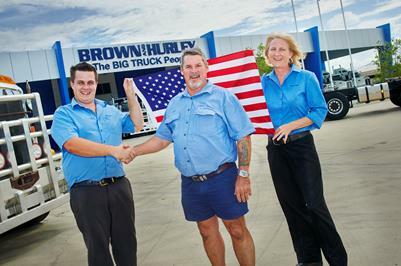 Against a field of more than 25 top dealers across Australasia, Brown & Hurley Yatala has been crowned Kenworth Dealer of the Year 2012 for outstanding sales, service and support. Leading Riverina transport contractor Deniliquin Freighters is operating two purpose-built Kenworth T909 A-Double roadtrains which haul 60 tonnes of export rice from SunRice's newly reopened Coleambally mill in southern NSW. A dealership from one of Australia's oldest truck dealer groups - Gilbert & Roach Newcastle - has just taken out the trucking industry's most coveted dealer prize, the 2011 Kenworth Dealer of the Year. The truck industry's leading customer rewards program, ALLRig Rewards, has achieved an outstanding result for the first half of 2011, doubling its membership and increasing member savings by over 450% compared to the previous six months. Competition winners! Paddy Knight (centre) is congratulated by Peter Keogh (left) and Karen Corbett (right) of Brown and Hurley outside the dealership.